There are a lot of ways to use sparklers at a wedding, and they make for a very inexpensive wedding favors to give to your guests. No matter how you plan to use sparklers at your wedding, there is one issue that looms heavy; how do you dispense them to your guests? Fortunately, there are plenty of simple and elegant was to accomplish this feat, and here are a few of the most common ideas. The simplest way to dispense your wedding sparklers is to place a package at each spot of your tables. That way, your guests can’t miss them and they can actually add to the elegance of your wedding décor. Just make sure you find wedding sparklers that are elegantly packaged so that they don’t clash with your other decorations or look tacky at each place setting. Many wedding sparkler companies ship them out in ugly boxes that will look terrible and ruin the overall vide and ambience of your reception hall. Placing a bucket of sparklers on your sign-in table is another elegant and efficient way to dispense them to your guests. The easiest idea is to create a sparkler bucket so your guests can grab a few before they find their table. All you need is a simple metal bucket and attach a sign to the front of it that says “sparklers”. You can dress the bucket up more with some ribbons that match your wedding colors if you want to make it look a little nicer. Most couples have centerpieces at each table, and usually they include items like flowers and candy. However, your centerpieces are also a great way to dispense and display your wedding sparklers! You can mix them in with your existing flower bouquets without consequence, and put a little card on each table to explain what the sparklers will be used for and when that activity will take place. Best of all, you can usually use less flowers in each centerpiece if you include sparklers which can save you a little extra money for other parts of your wedding celebration! There are a lot of different wedding decorations that hang from the ceiling such as ribbons, garland, lights, and balloons, so why not hang your wedding sparklers too? It’s one of the most efficient ideas for dispensing your sparklers, and it can add to the look of your decorations. All you need to do is run some string or thin rope above each table and then use clothespins to attach your sparklers to the string. If you want to make the sparklers look nicer, you can add decorative sparkler tags or ribbons to coordinate with your other wedding colors. 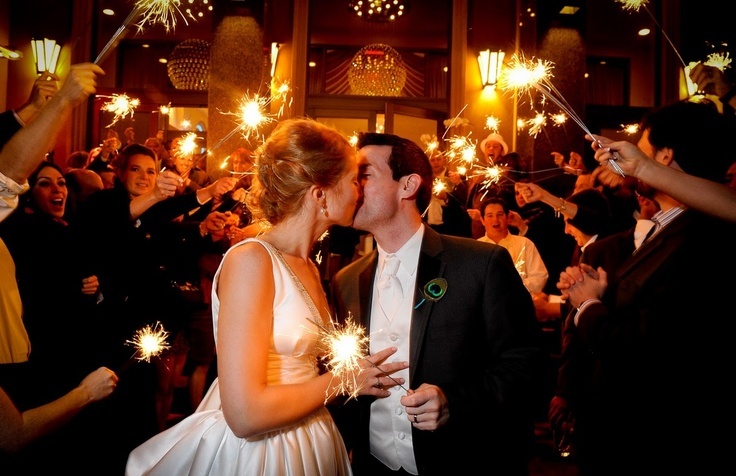 Using sparklers at your wedding can be a lot of fun, but the logistics can be time consuming it you don’t plan ahead. By using one of these fast and simple ideas to dispense your wedding sparklers to your guests, you can focus your time on other parts of the wedding and potentially save money while you do it. Previous ArticleWhich Breeds Of Dog Are Best For Running?